Certain eras have a visual signature that is much more assertive than others, and when it comes to the last century, I’ve always thought that the 1930s was a very strong decade in terms of graphic design, in sharp contrast to the weakness of the economy. 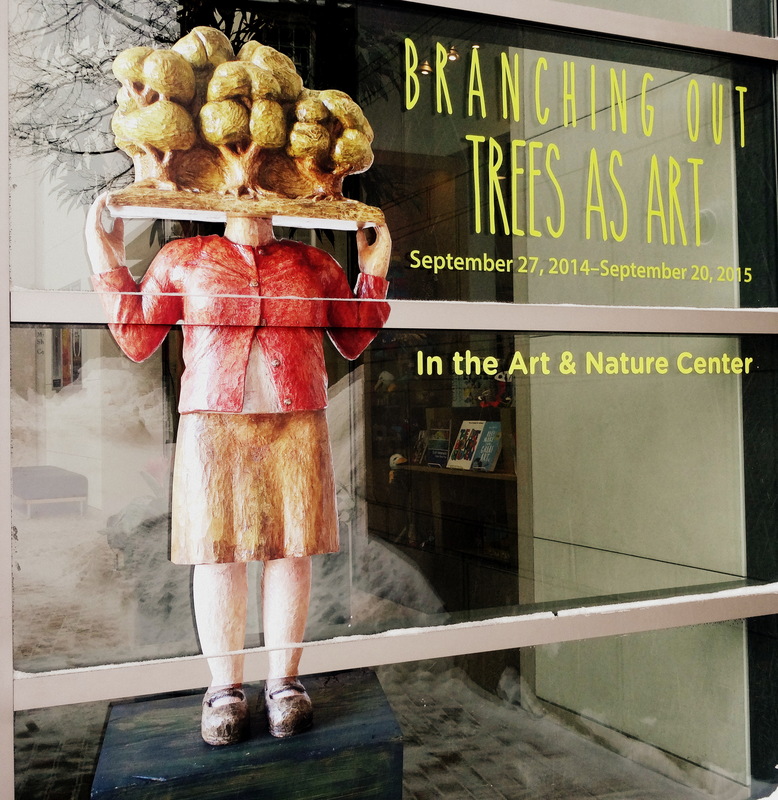 Is there an inverse relationship between art and anxiety? I think so. The bold WPA posters with their fat fonts seem like compensation for the bleakness and leanness of the times, and so too do commercial posters from that era. You see just one, and immediately you know when and why it was made: Cheer Up! An upcoming auction of vintage posters at Swann’s Auction Galleries is dominated by skiing posters from the 1930s, several of them designed by American artist Sascha Maurer (1897-1961) who seems to have specialized in this very specific genre. 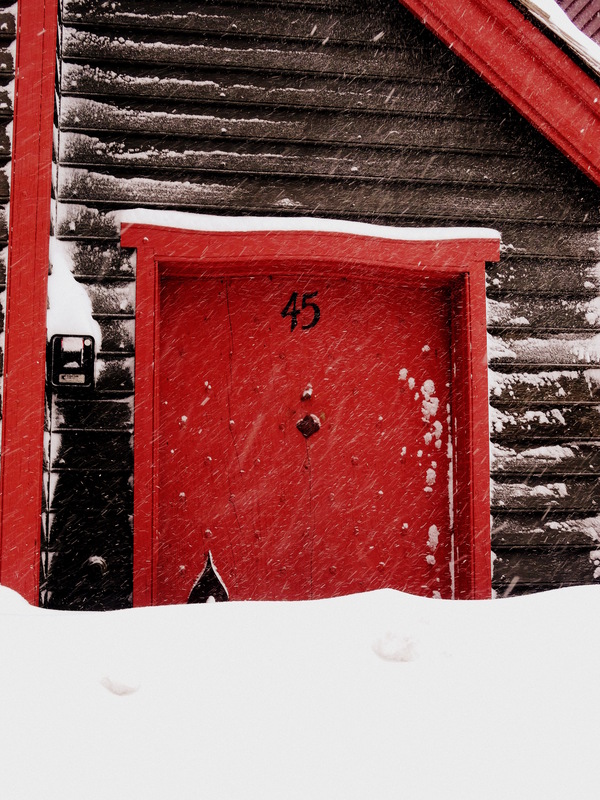 Whether they were sponsored by the railroad, or the ski manufacturer, or the resort, they all show shiny happy people on the slopes, and a bright world not too far from home for some, but still probably quite inaccessible. Go Skiing! Vintage Ski Posters by Sascha Maurer , c. 1935-37, Swann Auction Galleries auctions past and upcoming. 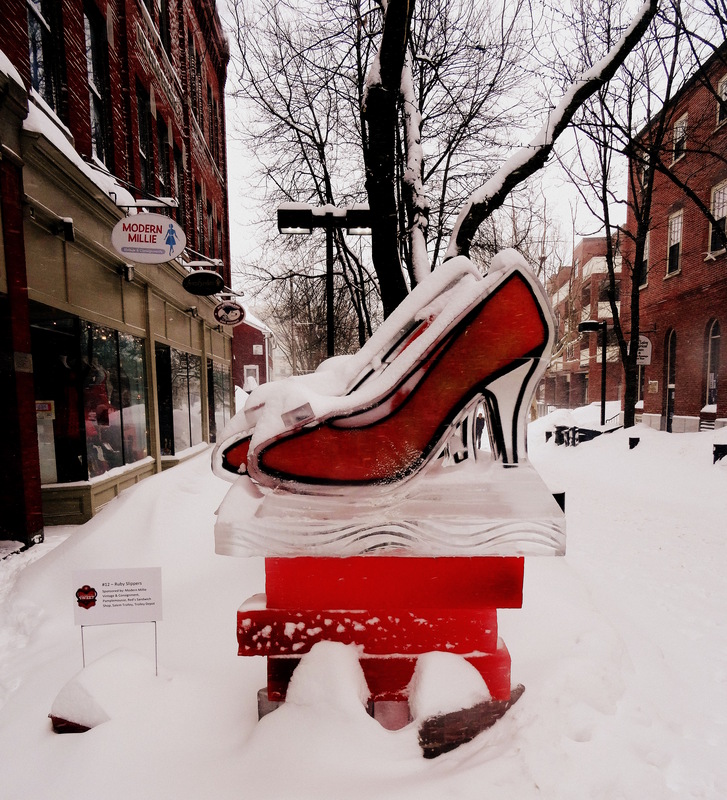 This weekend is the annual Salem’s So Sweet Chocolate and Ice Sculpture Festival, sponsored by Salem Main Streets, The Salem Chamber of Commerce, and Destination Salem, as well as all of the downtown businesses which underwrote the installation of ice sculptures on the sidewalks of Salem. It’s such a lovely idea, especially for a city that (in my opinion) has put too many eggs in the one basket of witchcraft tourism. As I walked by kitschy witchy businesses displaying signs on their front doors indicating that they were “closed for the season” (of course they meant the off-season, which is most of the year), it was a pleasure to see enthusiastic picture-takers clustered around ice sculptures of Gustave Klimt’s The Kiss, various sea creatures, and the Mad Hatter, and even imbibing in Rockefella’s amazing ice bar, which must take the prize this year. 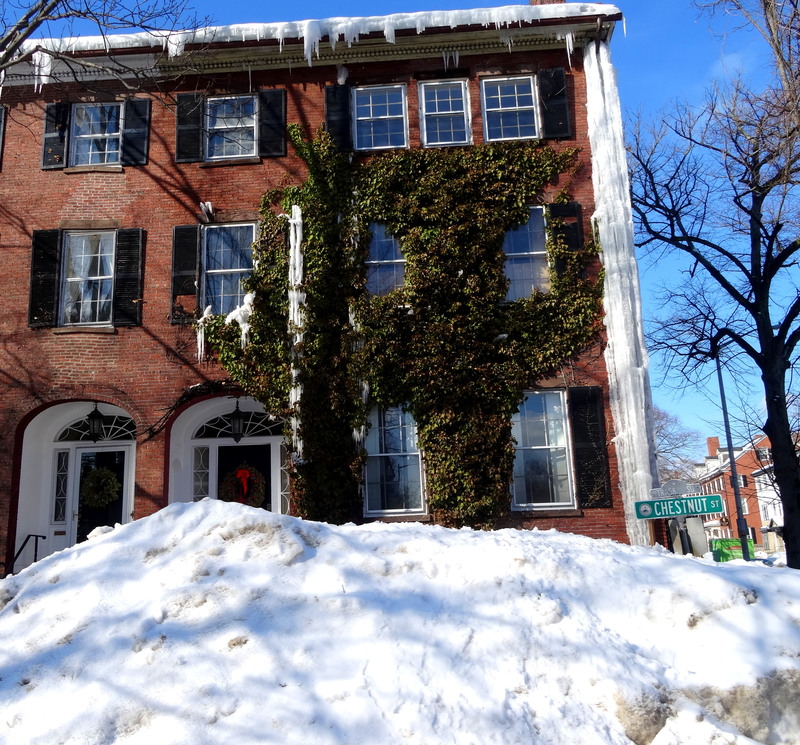 It was a beautiful day–not too cold–and sunny, so lots of people were out and about and the restaurants looked busy. 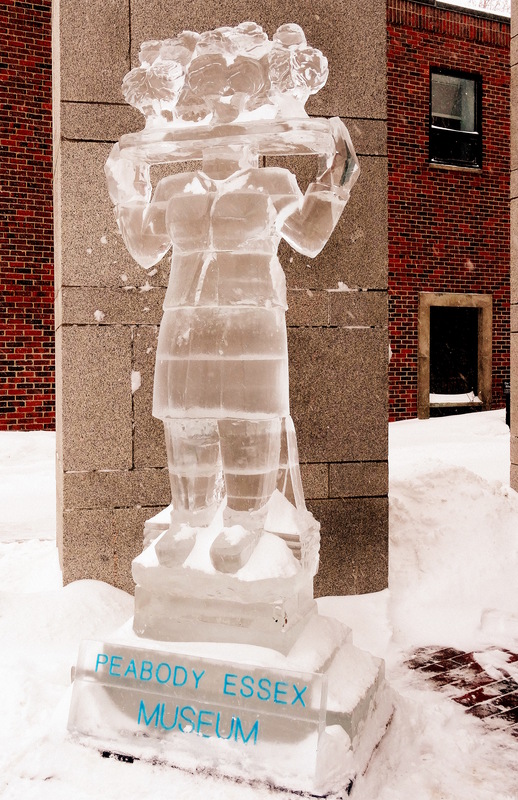 Last year’s snowmaggedon must have chilled this event a bit (though it was still definitely on) but this year’s weather was perfect–and several of the statues were illuminated at night for the first time. 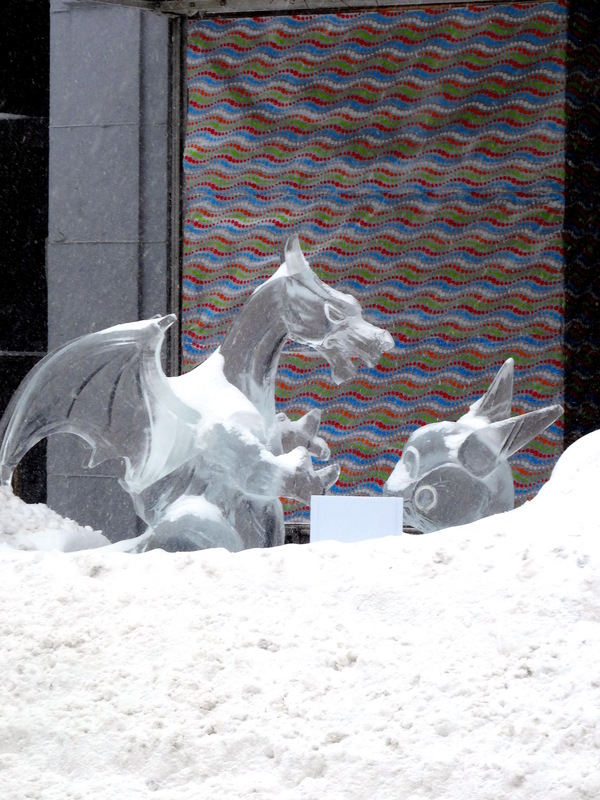 Just a few of the ice sculptures downtown this weekend: you can download the map of the rest here. 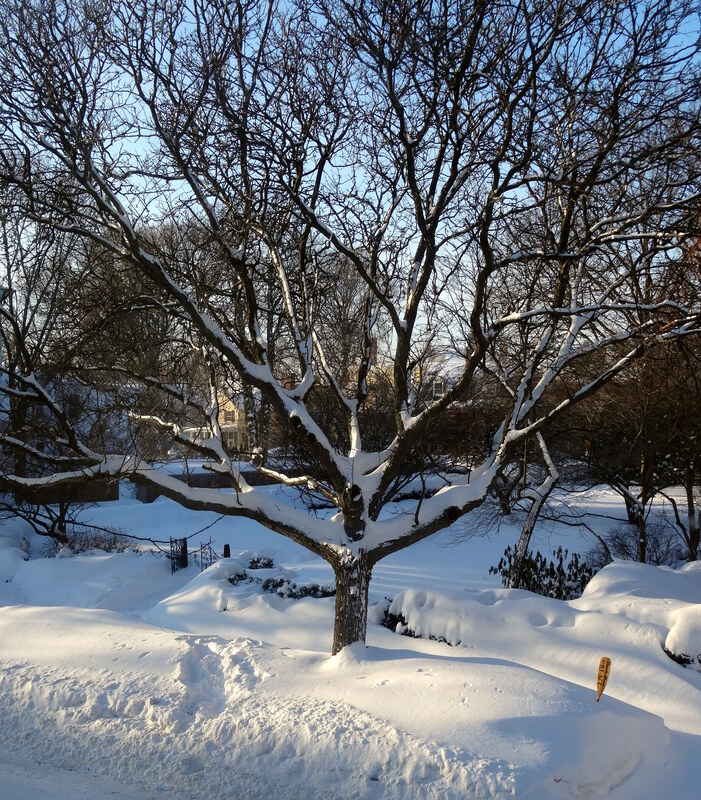 We had our first major snowstorm of 2016 yesterday, which paled in comparison with those of last year. I mocked those decision-makers who declared snow emergencies and canceled classes yesterday morning when the streets were merely wet, but by mid-afternoon I had to admit that they were correct: a wet, heavy, continuous snow had developed that would have caused numerous problems if everyone was on the road. Later in the afternoon I heard a sharp crack, and one of the the heavy, long branches of a tree across the street fell into my neighbors’ driveway. There was a strange white sky all afternoon which you will see in the pictures below (some of which I doctored just a bit), so contrast was rather elusive, but our bright yellow house was a perfect background for the broken branch. At the end of the day the white sky turned a beautiful pink, a moment which I completely failed to catch but fortunately my neighbor Bill did–and it looks like blue is back this morning. 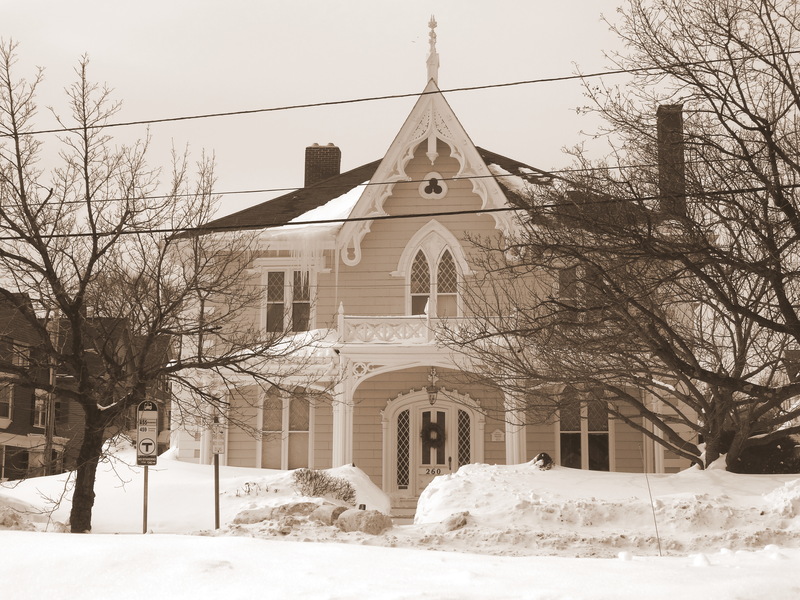 Chestnut Street February 2016 and below, a similar winter’s day on the street in the 1890s–when McIntire’s South Church was still there. Never have I been so excited for the arrival of March, generally the muddiest month! 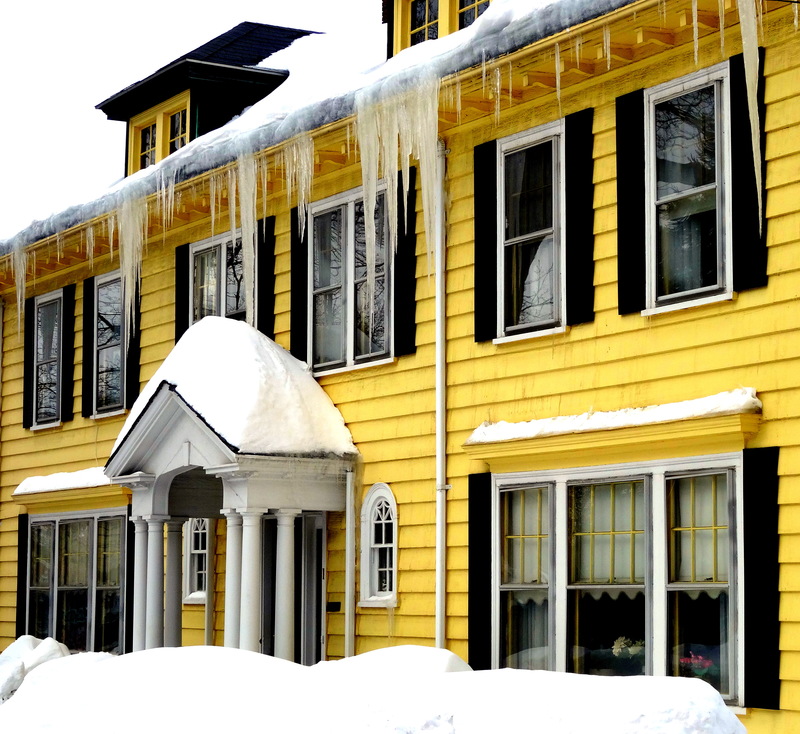 February has simply brought us too much: snow, ice, hassles, damage, cancellations, time indoors. 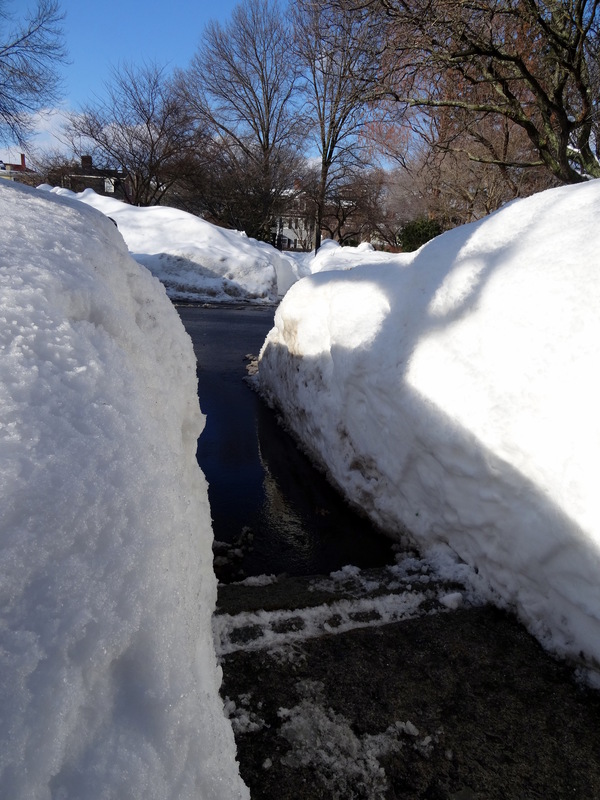 I’m clearing out my cache of February pictures today with the hope that March will mean the last of all this, but I might be too optimistic: there’s still feet of snow on the ground and cold weeks ahead. 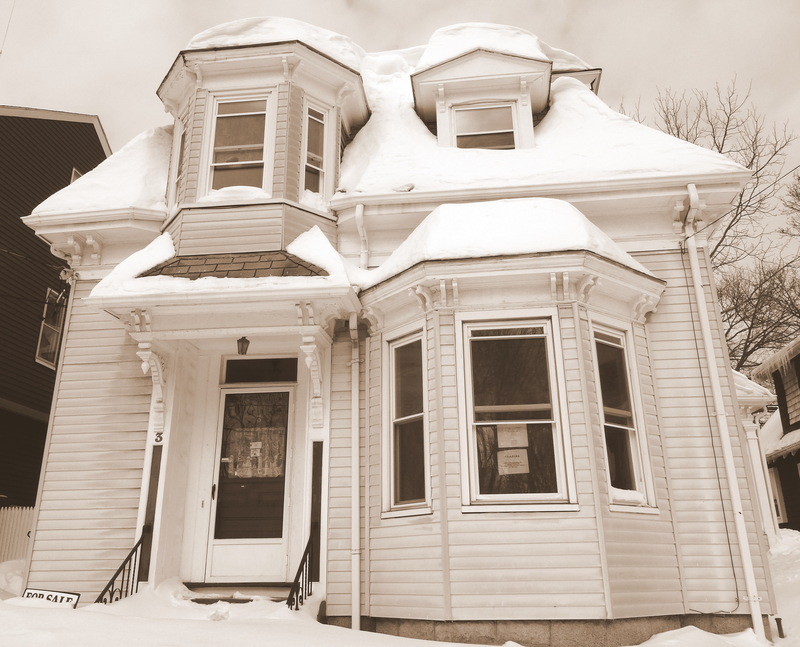 But nevertheless I am moving on–the days grow longer, the sun seems stronger, spring break is right around the corner and garden catalogs are stacked high by my bed. 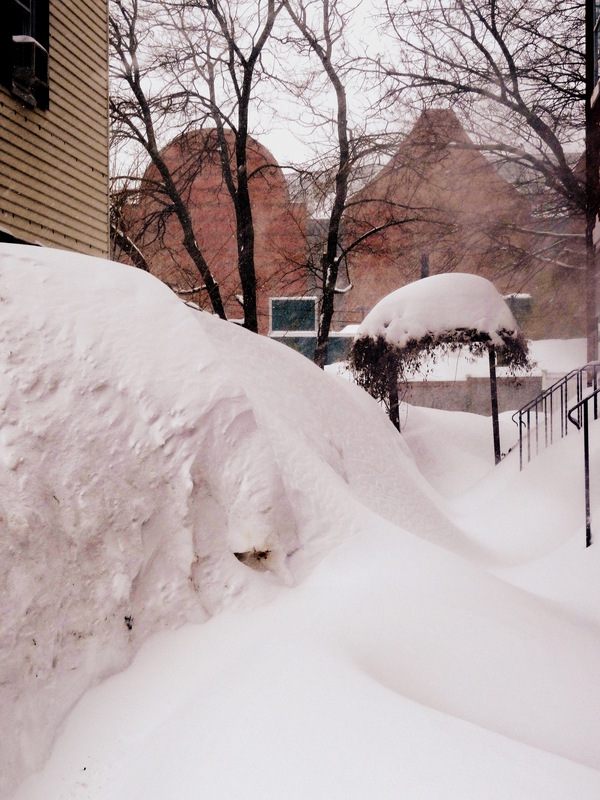 I have received so many emails from readers expressing both sympathy for, and interest in, our big snow that I’m going to take back the vow from my last post and focus on snow yet again today. 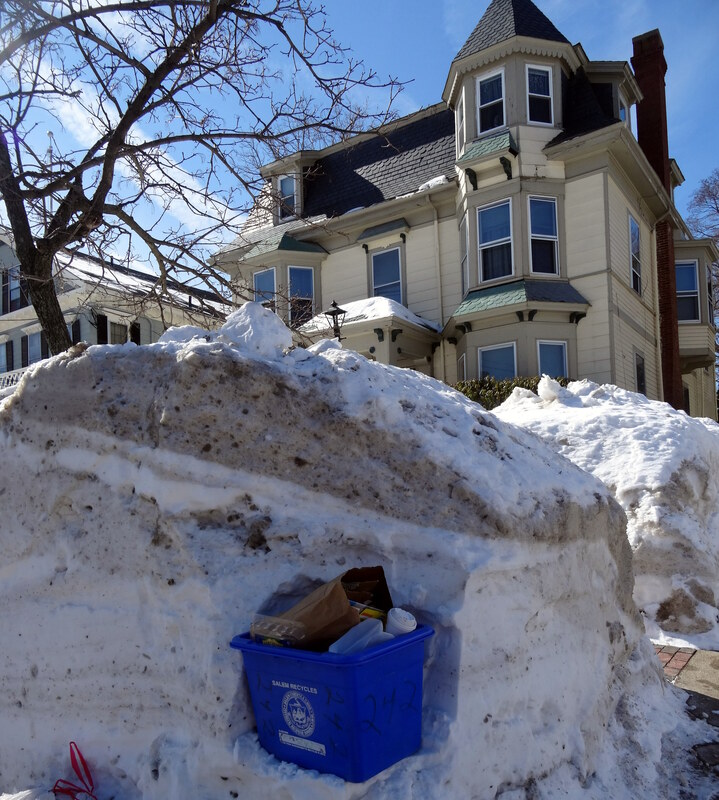 We seem to be in the snow management phase here in Salem: the Mayor called in the National Guard, many (though not all) streets are clear, people are out and about, the snowbanks are stacked high, and the discussion seems focused on commuting and ice dams. 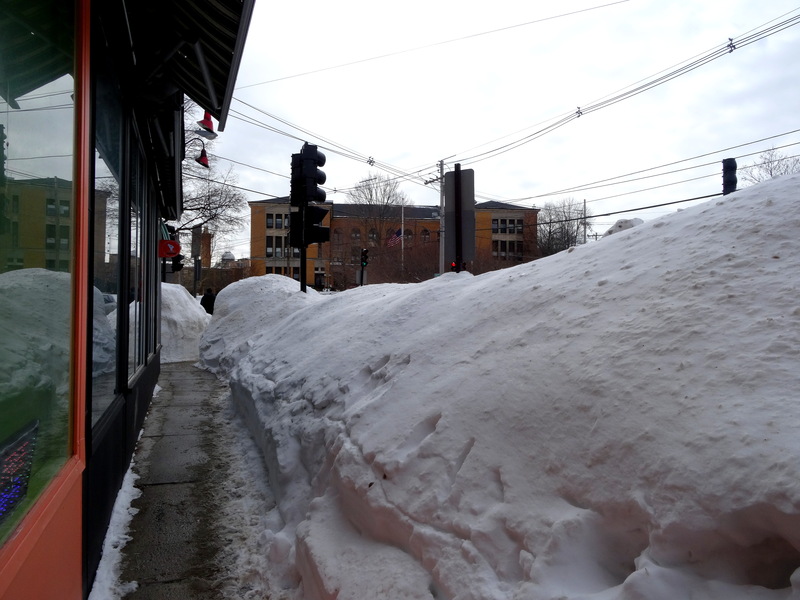 Regarding the former, my perspective is that of a pedestrian, and its all about navigating the sidewalk tunnels that have been formed by the looming snowbanks, which are eye-level (my eyes, and I’m pretty short) at best and way, way above my head at worst. 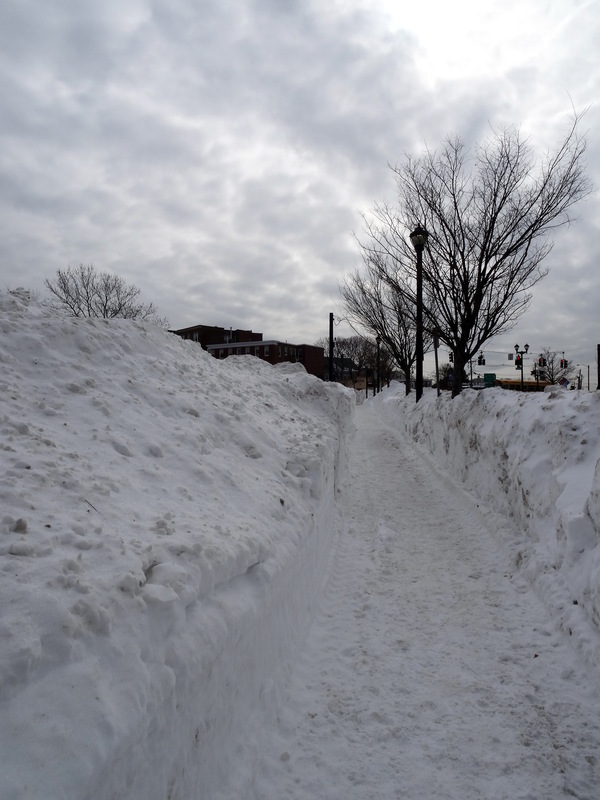 I like walking the mile or so to work even in weather like this, and though I think of myself as a rugged New Englander because of this, yesterday I was put in my place by one of our visiting professors, whose commute includes riding a bicycle (thankfully she is Dutch) from Cambridge to Boston to get the train up to Salem! Now that’s a tough commute–the latter part might be even more difficult than the bike hike as our public transportation system (the MBTA, which we simply call the T) is in full-fledged operational crisis right now–a wake-up call for a city that wants to take on the Olympics, for sure! Certainly my tunnel commute is not so difficult, and I’m always easily distracted…….. 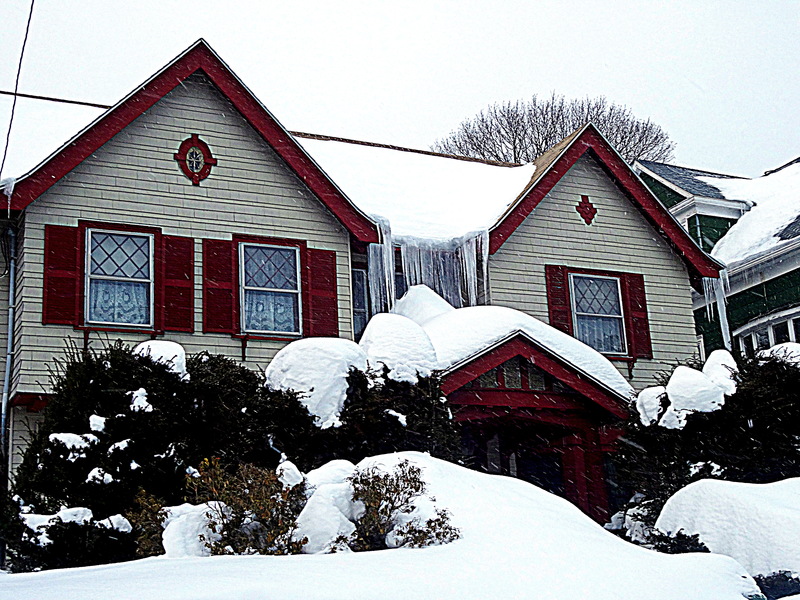 Going to work in snowbound Salem: first I check all the leaks in the house before I leave…..this is a little one. 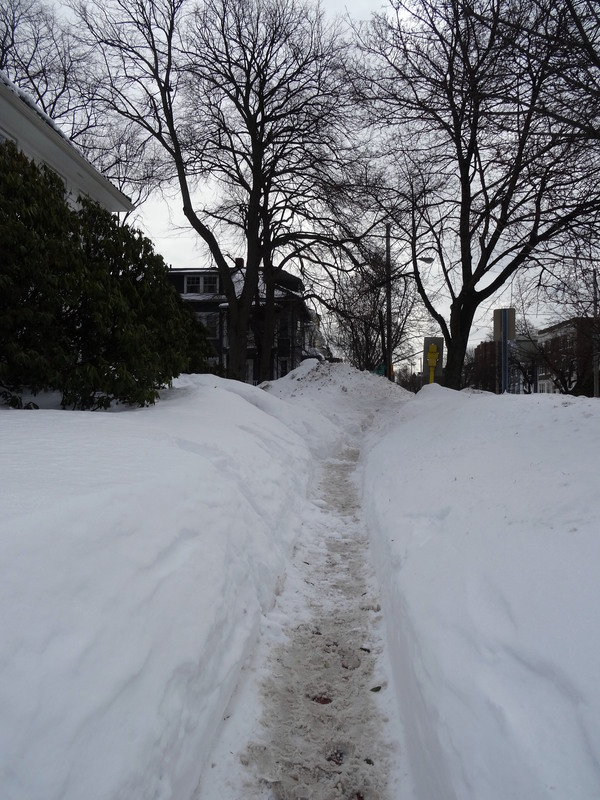 Then I’m off….pretty wide paths downtown, which narrow once you get on Lafayette. 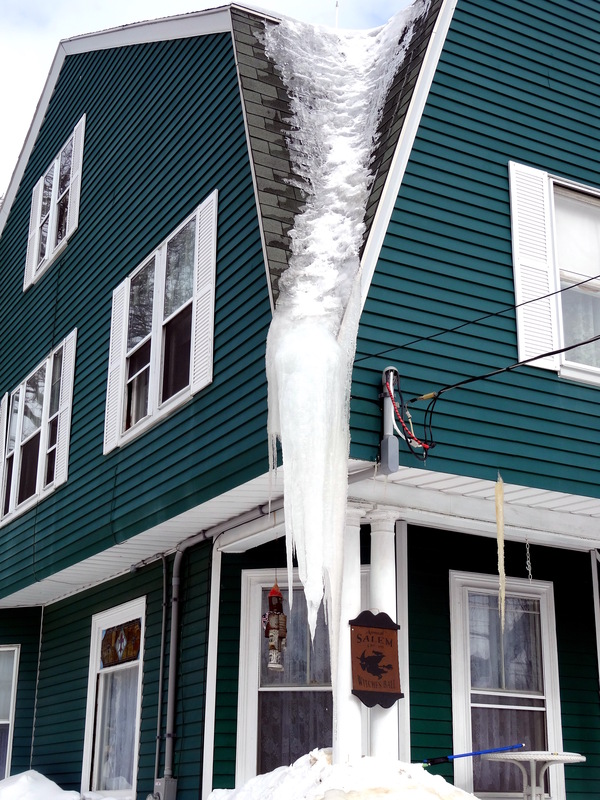 Interesting icicle formation…cute little white house, looks like no one is living there, hope they don’t have any ice dams….back on track and end in sight. 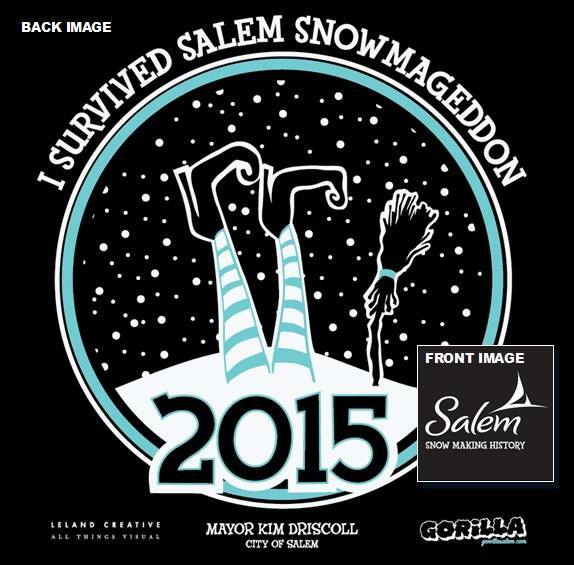 Appendix: Design for T-shirt produced to reward heroic snow efforts and fund anti-measures, available through the Mayor’s Office. 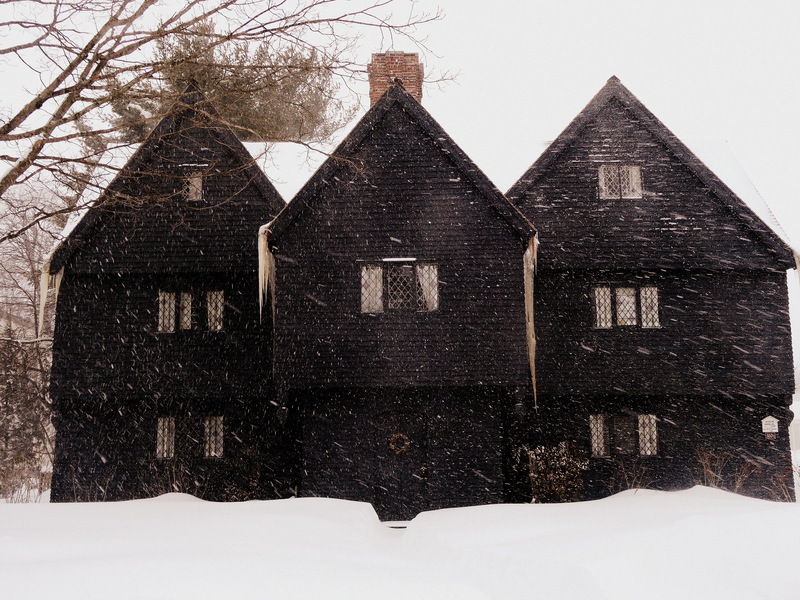 Of course, it is witchy but it doesn’t seem to bother me as much as usual. 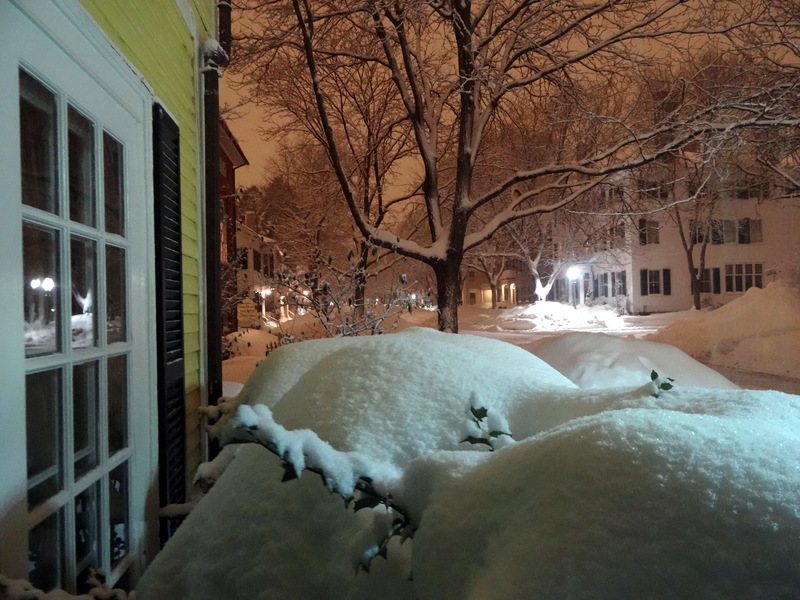 I’ve got nothing…but snow: sorry, worldly readers, I must feature snow yet again! 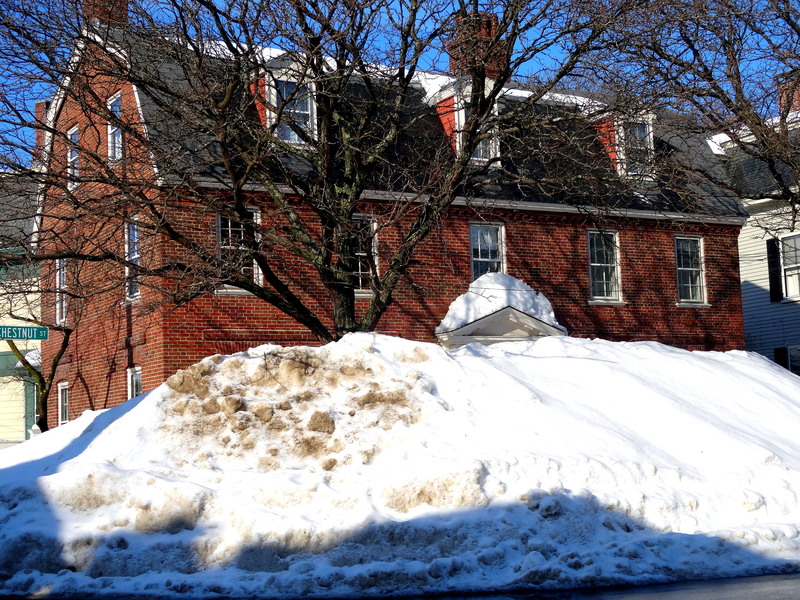 With another 17 inches deposited from this weekend’s storm, we are now up to about 7 ½ feet by my unofficial calculation. 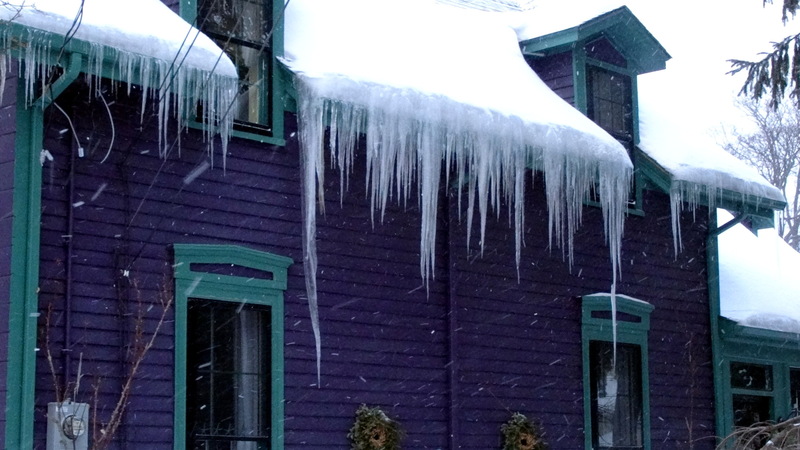 We’ve got two major ice dams over our bay windows (thanks Victorians!!! 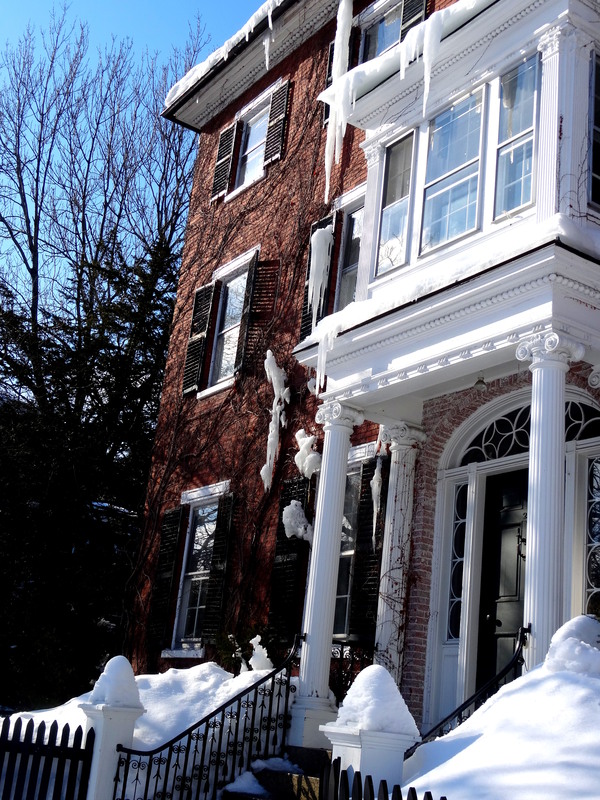 the 1820s house is tight as can be) that have been depositing incessant drops of brown water into our house over the past few days, and I woke up happy this morning because it was so cold that the leaking stopped…for awhile. That about sums it up. You do develop perspective when you go through a prolonged period of weather adversity, and begin to focus on the light at the end of the tunnel. I’m not sure that our tunnel is coming to an end yet (it’s only February! ), but I did see a lot of light this weekend. Saturday night we walked to dinner through the snowy streets and I noticed it was so light outside, and when we returned home it seemed lighter still. 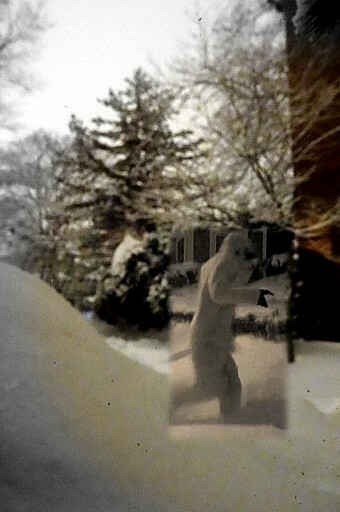 What the weatherman was calling a blizzard was intensifying, and the sky was an eerie light gray–I almost expected to see the famous Boston Yeti out back….and there he was! 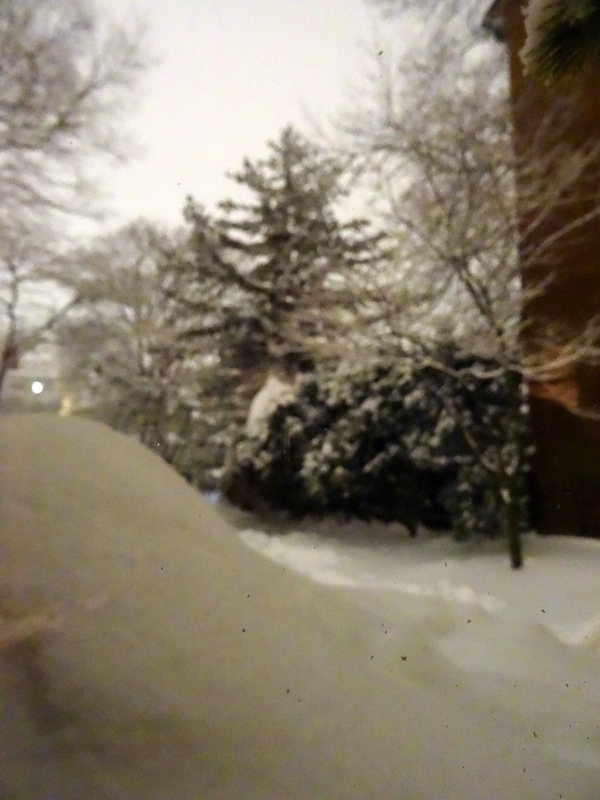 Sorry it’s so blurry–I can’t venture out back because we haven’t shoveled, so this (these) picture(s) was taken through my dining room window, while it was snowing. 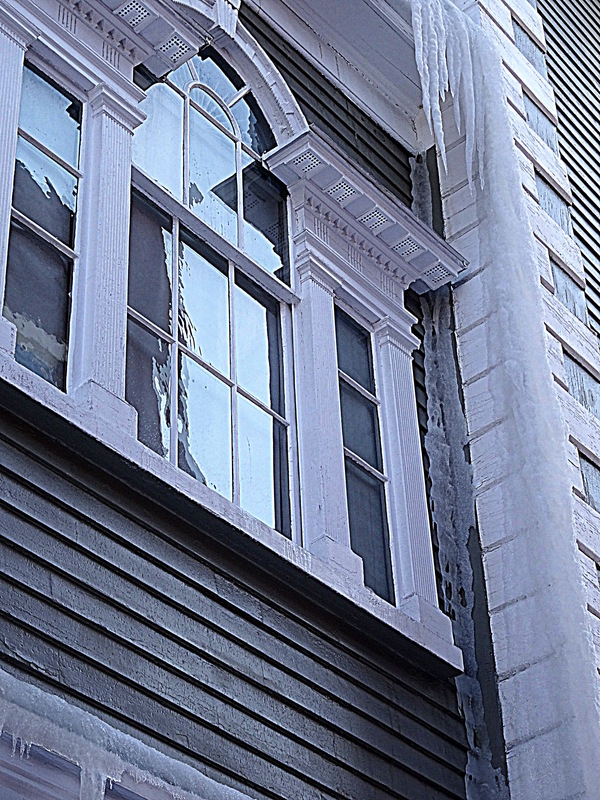 And yes, this is a rather pathetic attempt to place the Boston Yeti in Salem; he/she lives in Somerville, I believe. 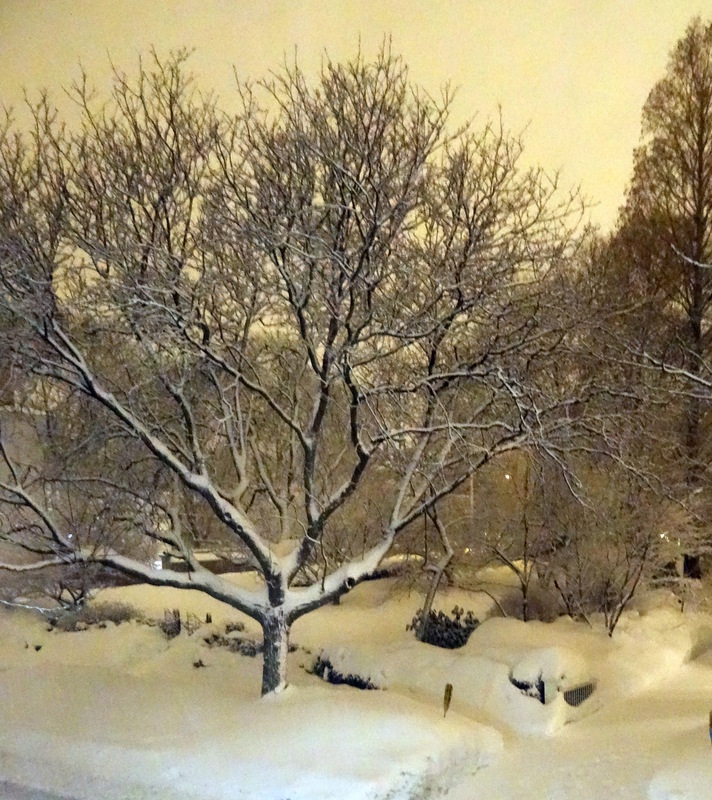 Seriously, that snow-lit sky was beautiful on Valentine’s Day evening, even though it meant ever more snow. 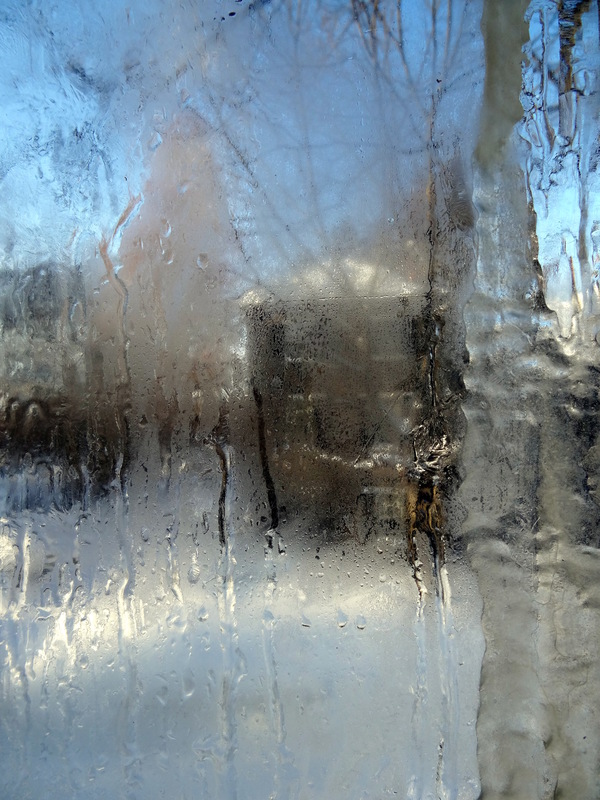 And yesterday, blustery cold. 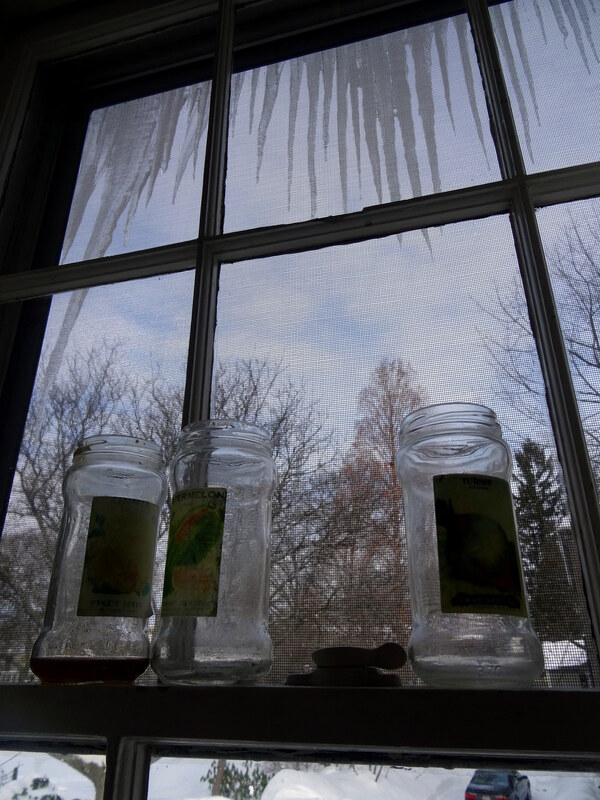 Behold the inside of my second-floor library window, with major ice-dam leak above: all clear and dry today, for now. 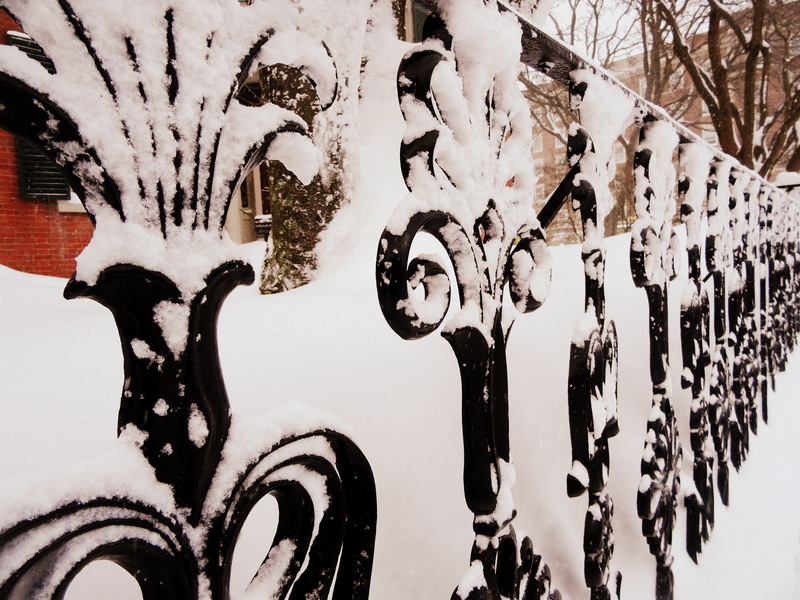 I promise: this is my last post on snow! 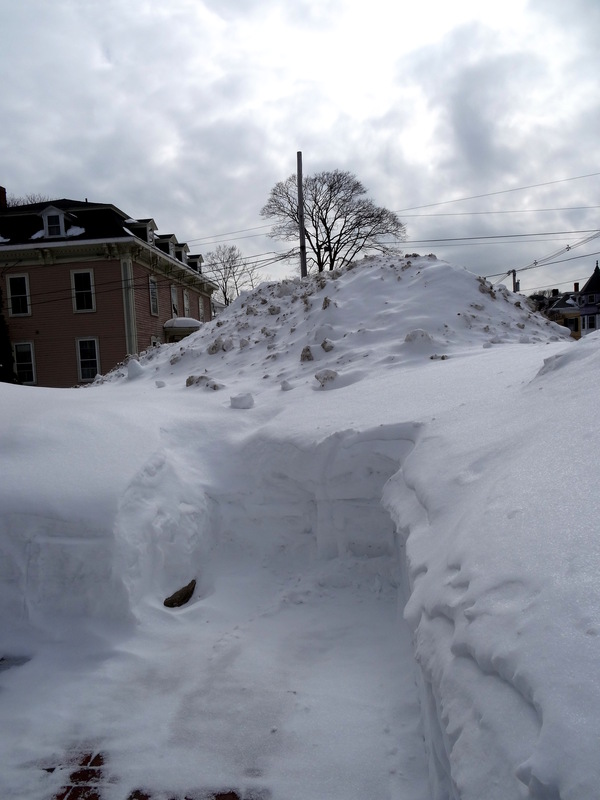 Six feet of snow in the last two weeks have buried eastern Massachusetts. 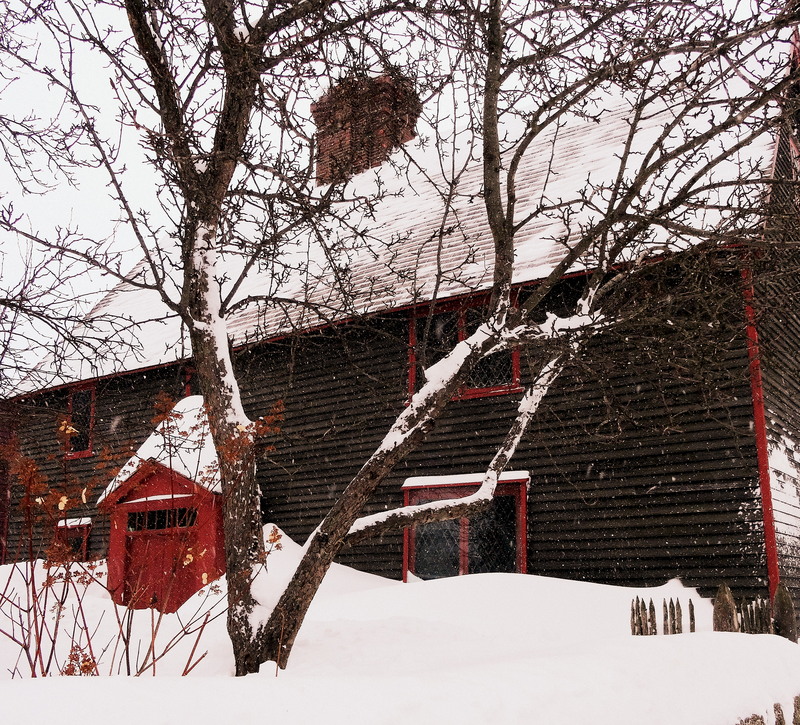 We received 19 inches of snow here in Salem from this last slow-moving storm, which landed on top of the 4+ feet that was already there. 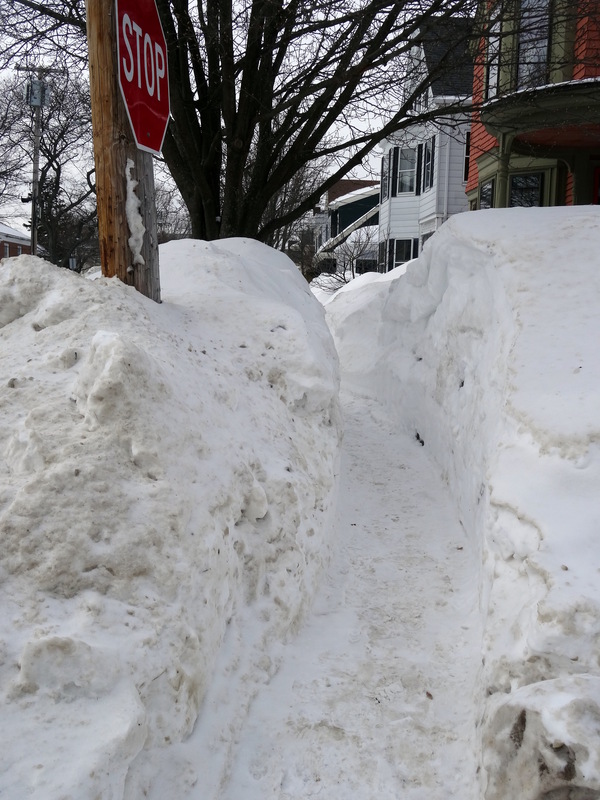 Last week, I laughed when I ran into people (usually shoveling) who proclaimed that this is worse than ’78 (always the standard for New England blizzards) but now I’m not so sure: this is bad. 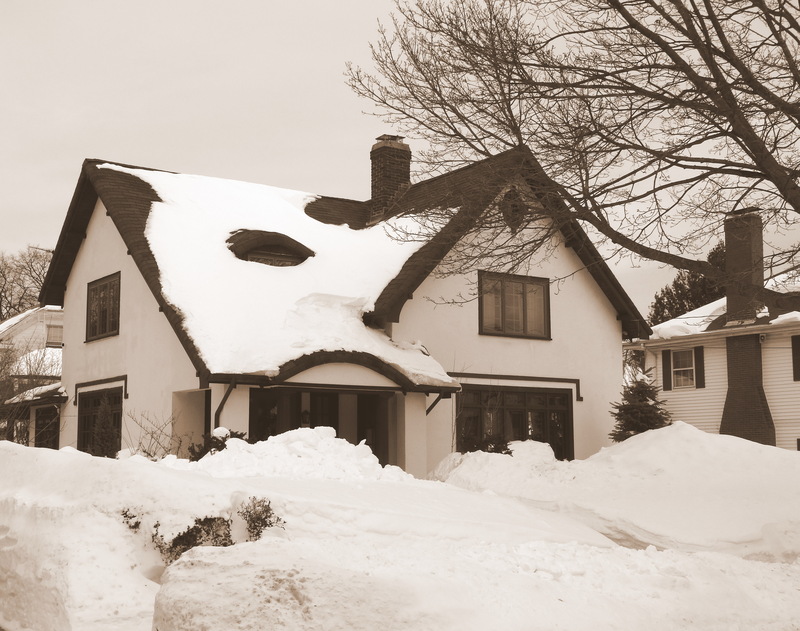 No one storm was worse than 1978 but collectively our three successive storms have produced far more snow than that fabled blizzard over this two-week period. 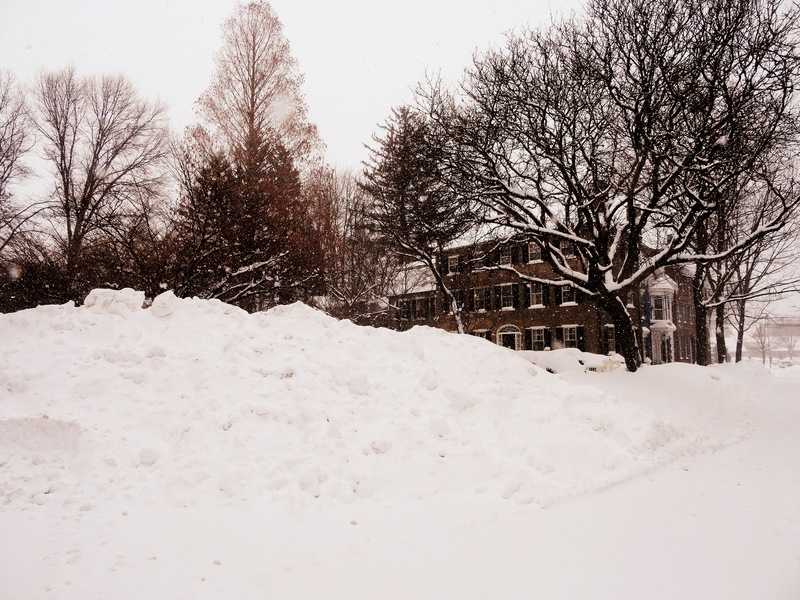 Yesterday I noticed that the snow standard had shifted to the “Great White” Blizzard of 1888, leaving ’78 in the dust: with more snow on the way at the end of this week I wonder if we will be referencing the nearly-biblical “Great Snow” of 1717? 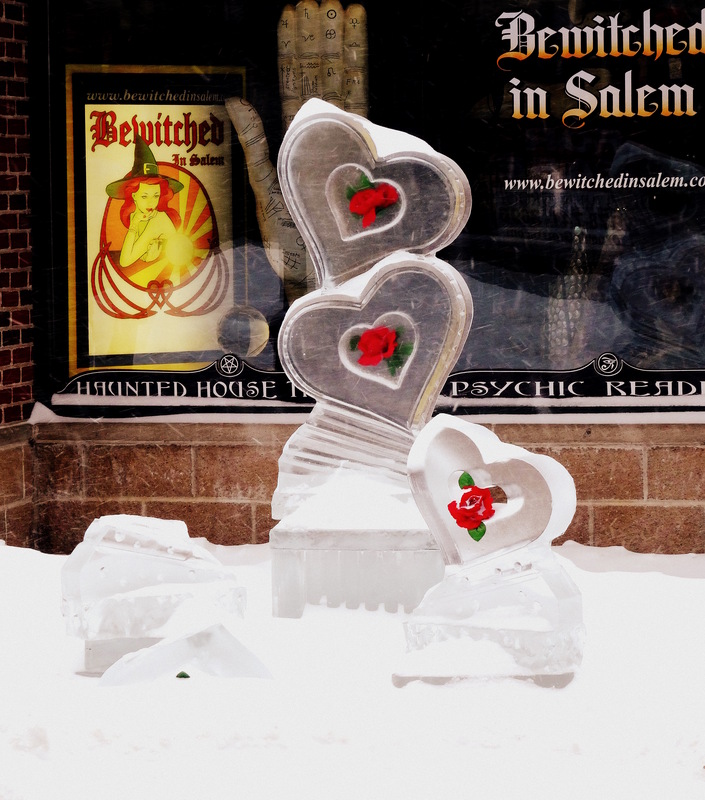 I ventured into a deserted downtown to see the ice sculptures installed as part of the now traditional pre-Valentine’s Day “Salem’s so Sweet” festival: a great idea designed to drum up commercial activity in the doldrums of February. 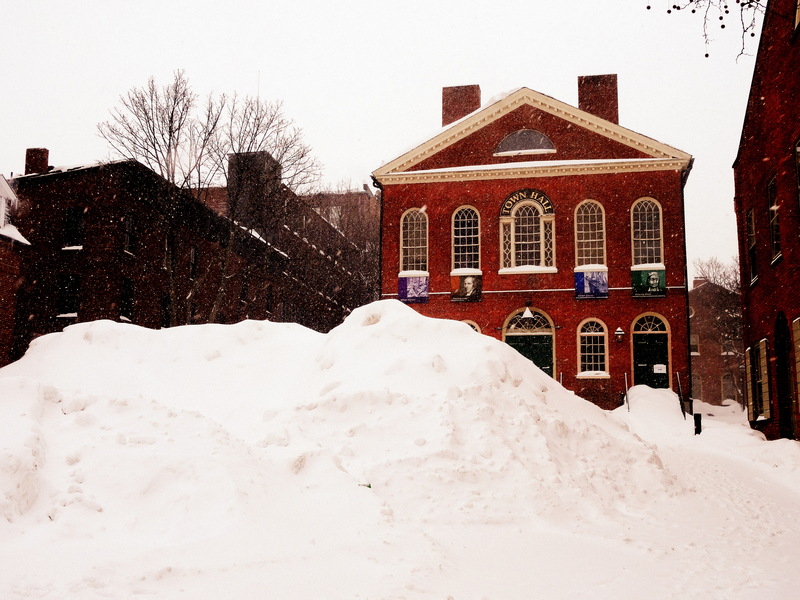 With all this snow, the doldrums (great word) are even more depressing for Salem’s shops and restaurants. 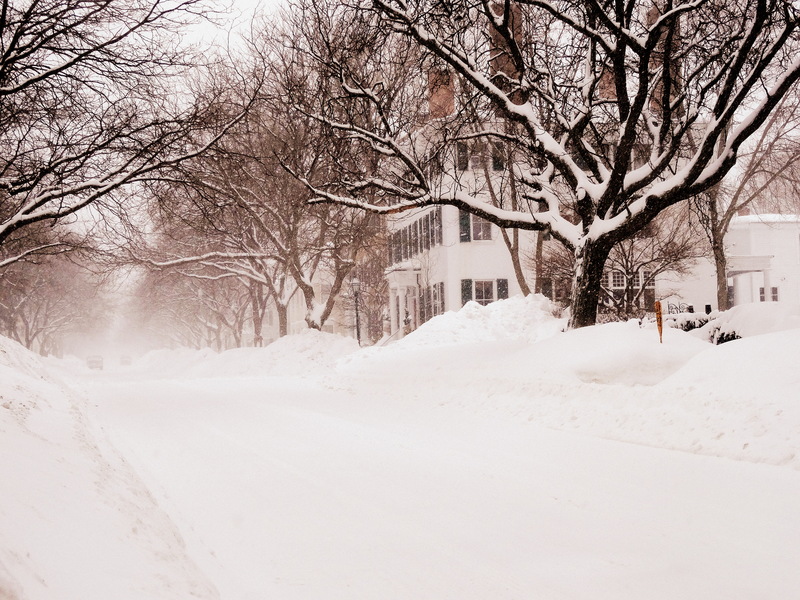 So I was happy to see another great idea surface on Facebook yesterday: a “snow day shop and dine” in Salem initiative encouraging us all to get out of our homes and into these local businesses. I’m there, always happy to shop (and to lesser extent, eat) as an expression of my civic duty. 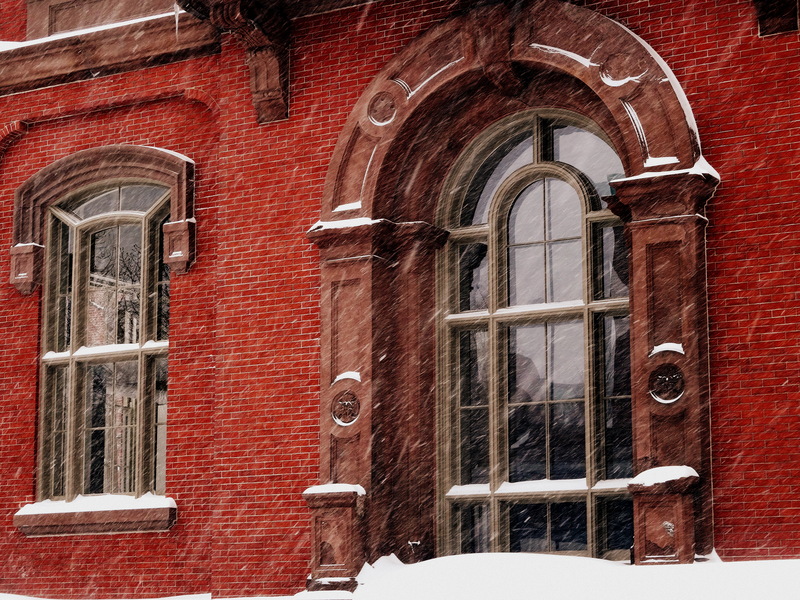 I feel sorry for all the disruption and am experiencing it myself: I have a weekly Monday Renaissance class that has failed to meet for the last two weeks, and of course we have the Presidents’ Day holiday on this coming Monday (on which it will probably not snow). It’s going to be difficult to get a momentum going in that class: all teachers are feeling this way now, I am sure. 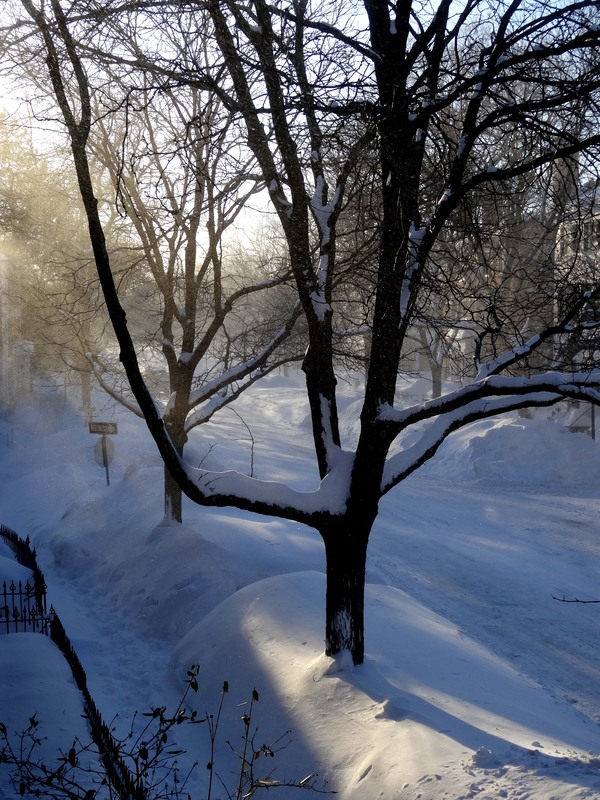 On the other hand, I’m grateful that I’m not stuck on some suburban cul-de-sac and can step outside my door, leave my car buried, and stroll (well, trudge) downtown to see the sights, covered or uncovered.